Monitoring greenhouse gas emissions: Now more important than ever? As part of Green Great Britain Week, supported by BEIS, we are posting a series of blogs throughout the week highlighting what work is going on at the University of Bristol's Cabot Institute for the Environment to help provide up to date climate science, technology and solutions for government and industry. We will also be highlighting some of the big sustainability actions happening across the University and local community in order to do our part to mitigate the negative effects of global warming. Today our blog will look at 'Explaining the latest science on climate change'. Reading the report has quite honestly been somewhat overwhelming but also necessary to understand exactly what we are in for. And as much as I understand the difficulty one might face either with the technical terms of the report or even the volume of information, I would really encourage you to give it a read. This special report covers a wide range of subjects from oceans, ice and flooding to crops, health and economy. However, if you do find that the chapters themselves are too lengthy or difficult, there is an amazing interactive, and very easy way that will help you explore the impacts of a 1.5 ˚C, 2 ˚C and beyond on Carbon Brief’s website. There are two distinct parts in the IPCC special report. The full technical report that consists of 5 chapters and a short summary for policy makers (SPM). The SPM clearly states that “Estimated anthropogenic global warming matches the level of observed warming to within ±20 %” which translates into ‘almost 100 % of the warming is the result of human activity’  . One outcome of this “human activity” that we often discuss is the emission of greenhouse gases (GHGs). Through various types of activities, whether that is agriculture, deforestation or burning fossil fuels, GHGs are emitted to the atmosphere. Without going too much into the chemistry and physics, what these GHGs do is change the mixing ratios within the atmosphere, resulting in greater absorbance of infrared radiation. And it is this change in the composition of our atmosphere that we refer to as the manmade greenhouse gas effect which also leads to the warming described in the IPCC report. But far more than the warming effect itself, global warming has all sorts of impacts most of which you can explore through the interactive link above. Some of the ‘usual suspects’ in the discussion of GHG emissions are carbon dioxide (CO2), methane (CH4) and nitrous oxide (N2O) (often described as the ‘major’ greenhouse gases ). However, an often-overlooked set of halogenated greenhouse gases are playing an increasingly large role in anthropogenic driven climate change. Gases like perfluorocarbons (PFCs) and hydrofluorocarbons (HFCs) are compounds that are emitted through some form of human activity. In the case of PFCs for example, the GHGs CF4 and C2F6 are two of the most volatile and long-lived gases monitored under the Kyoto protocol  and they are both primarily emitted through or during industrial processes. In contrast, HFCs are used widely as coolants in refrigerators and air-conditioning units, as blowing agents in foam manufacture and propellants in aerosols. They were originally introduced to replace ozone-depleting gases such as chlorofluorocarbons (CFCs), but like their predecessors, are potent greenhouse gases. Given the long lifetime of many of these halogenated gases, current emissions will influence the climate system for decades to come. In order to monitor the accumulation of these gases in atmosphere, high-precision measurements are required. Through projects such as the Advanced Global Atmospheric Gases Experiment (AGAGE)  (figure 1 ) that has been measuring the composition of the global atmosphere continuously since 1978 and the National Oceanic and Atmospheric Administration’s Earth System Research Laboratory Global Monitoring Division, scientists have tracked the atmospheric concentrations of climate forcing gases from as far back as 1950s . The ACRG carries out research in the UK and worldwide in collaboration with other atmospheric chemistry research centres, universities and third parties. In the UK, the ACRG runs the UK Deriving Emissions linked to Climate Change network (DECC) , funded by the Department for Business, Energy and Industrial Strategy (BEIS) to measure atmospheric GHG and ozone depleting substances over the UK. These measurements are used in elaborate mathematical models to create top-down emission estimates for the UK and verify the UK GHG inventories submitted to the United Nations Framework Convention for Climate Change (UNFCCC) as part of the Kyoto protocol. Worldwide, the group is involved in the AGAGE network, monitoring global background levels of a wide range of GHGs. 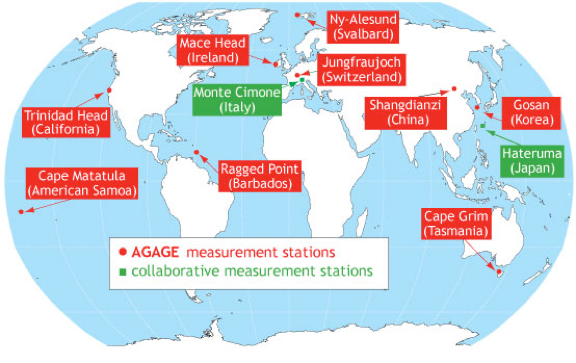 The ACRG runs 2 of the 9 global background stations under the AGAGE programme. One of these is the Mace Head station (Figure 2) on the west coast of Ireland, which is ideally placed for resolving northern hemispheric baseline air amongst European pollution events. The other AGAGE research station managed by the ACRG is the site at Ragged Point, Barbados. This site just north of the tropics, sits on the eastern edge of the island of Barbados and is directly exposed to the Atlantic. The researchers in ACRG study a variety of GHGs and a very large range of topics from maintaining instrument suites to ensuring the quality of the resulting data so that it can be used in modelling studies. 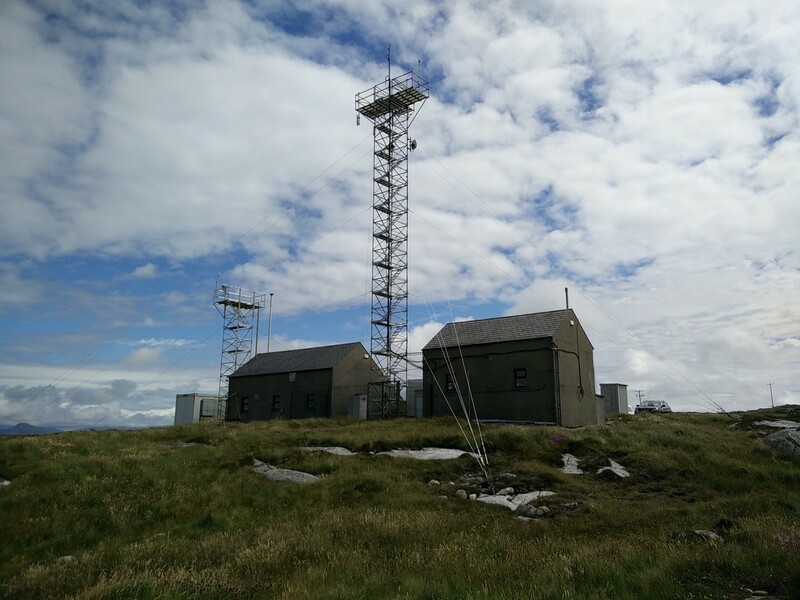 Why are measuring stations and networks like AGAGE so valuable and more important than ever? The answer to this question is straightforward. Without measurement stations and their underlying networks, we would have very few means  by which to measure the accumulation of GHGs in the global atmosphere, and consequently no way of evaluating their emissions without relying on statistics from the industries that emit them. The current IPCC report is underpinned by such measurements, which allow scientists to estimate the impact of anthropogenic activity on past, present and future climates. From Mauna Loa and its 60 -year record of atmospheric CO2 , to unexpected growth in emissions of banned substances such as CFC – 11  and monitoring the accumulation of extremely long-lived greenhouse gases in the global atmosphere, atmospheric measurements stations have been our inside man when it comes to keeping track of what is happening in our atmosphere and to what extent human activities are altering its composition. Perhaps now more than ever, in the light of the IPCC report, we can appreciate the importance of the data that have been collected over decades but also, the efforts of those who have been directly or indirectly involved in this kind of work. Continuing and expanding the measurement networks for these gases is and will be even more vital for a continued understanding of global and regional GHG emission trends. This blog is written by Cabot Institute members Eleni Michalopoulou, Dr Dan Say, Dr Kieran Stanley and Professor Simon O'Doherty from the University of Bristol's School of Chemistry.